Last Friday I picked up two more carabiners from Climb Kalamazoo on my bike ride to Plainwell Ice Cream (French Silk = Amazing). 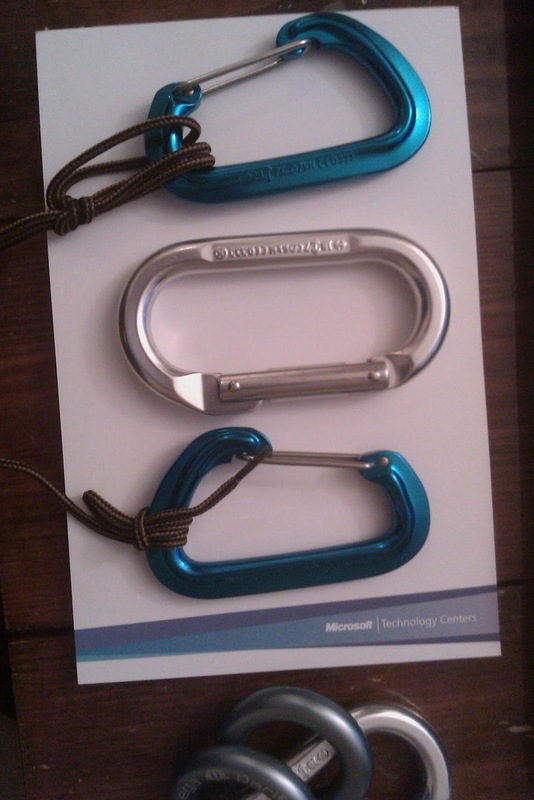 The two old ones are the silver Black Diamond carabiners in the picture below. The new ones, Black Diamond Neutrino, are absolutely fabulous. They are lighter, support more force, and easier to attach to the rappel rings. I have been playing around with a new way to hang my hammock using one carabiner and one rap ring on each side (versus one carabiner and two rap rings). In terms of knots, the bottom carabiner in the picture shows a clove hitch + a half hitch. The top carabiner shows a double figure of eight knot, however it's not fully pulled through allowing for a quick release of the knot and inability of the knot coming undone.